One day I was sitting in the upstairs living room of Sat	Eisaku. In a room surrounded by the autographed portraits of Queen Elizabeth II, the late Prime Minister Yoshida Shireru, and other notable world figures, the former prime minister who had just received his Nobel peace prize, was in a relaxed and jovial mood. “Tell me, why is Bucknell so interested in Japanese studies? Is there any special tradition behind it?” he asked. I wonder how many in his home town know who J.C. Hepburn was. In Japan his is a household name. As a medical missionary, he tirelessly treated thousands and thousands of Japanese. As a translator of the Bible, he left an indelible mark on Japanese Christianity and literature. As the compiler of the first Japanese-English dictionary, he set the standards for others to follow. He created the Hepburn system of Romanization which in its modified form is still in use today. He established a Bible-centered Shiloh Church in the heart of Yokohama, which is now the second largest city in Japan. He founded a Christian college that is now a university. His wife established an English school as a means of teaching the Bible. She educated some of the best minds in modern Japan, including one young man by the name of Takahashi Korekiyo who became Japan’s prime minister and finance minister. The list goes on. J. C. Hepburn was a giant among those who helped usher in Japan’s modernization. Commodore Perry and Townsend Harris opened the door of Japan for diplomacy and trade, but it was men like Hepburn who opened the hearts and souls of the Japanese people to the word of God and to the Western civilization. The saga of this remarkable man began on March 11, 1815 in Milton, Pennsylvania where he was born. His early education was from his father Samuel and mother Annie, who were both well-steeped in Scottish Presbyterianism. After Milton Academy, at the age of 16 he enrolled at Princeton College where he studied chemistry and classics. Instead of choosing law, as his father desired, he entered the Medical College of the University of Pennsylvania, graduating from there in 1836 at the age of 21. The following year, he joined the First Presbyterian Church of Milton. The notion of becoming a medical missionary suddenly overtook him. His father strongly opposed it, and he tried to wipe away this notion to please his family. But his heart was not at rest until he decided to go overseas. The sense of mission and calling was simply overpowering. In the fall of 1838, Hepburn opened his practice in Norristown, PA. There he met Miss Clara M. Leete from North Carolina, a teacher at Norristown Academy. 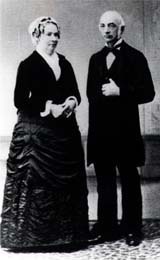 In October, 1840 they were married, united also in their desire to enter the mission field. They had their eyes set on China. As he later described it, they wanted to be in a country “where the people had no knowledge of modern medicine, and no one seemed to know the existence of the living god.” A circuitous trip to China began from the Boston Harbor in October 1840. Two months later, Clara miscarried while aboard the whaling ship Potomac. The original destination was Siam, where many missionaries were trained to enter China. But the boat only carried them to Singapore. There was a visit to Macao on the South China coast for a couple of months; otherwise the couple remained in Singapore for two years. A son was born to them there, only to die a few hours after his birth. Finally there was an opening at a mission hospital in Xiamen 厦门which the couple eagerly accepted. A trading post in the Fujian 福建province on the Taiwan Strait, Xiamen was known for its good water and scenic beauty. But it was also a land infested with mosquitoes, the cause of Malaria fever which was difficult to treat. James and Clara both contracted it, and the couple was forced to withdraw to Macao for treatment. Returning to Xiamen, Clara could not regain her health. Finally in November 1845, they decided to abandon their missionary work. On March 1846, they were in New York with their second and only surviving son Samuel, who was born in Xiamen. The Hepburns remained in New York for thirteen years, or until 1859. It was a small family practice at first, but there was an epidemic of cholera of the Asian strain in the city. The China experience helped Hepburn to diagnose and treat patients accurately. Soon he became a well-known physician in the city, and could maintain his own clinic, houses in the city, and a house in the suburb. Three children were born to the couple while in New York, but they all fell victim to either scarlet fever or dysentery. The personal tragedy rekindled in their hearts the desire to return to the mission field in the East, and the opportunity came with the opening of Japan. Americans in Japan shall be allowed the free exercise of their religion, and for this purpose shall have the right to erect suitable places of worship. No injury shall be done to such buildings, nor any insult be offered to the religious worship of the Americans. American citizens shall not injure any Japanese temple or mia (shrine), or offer any insult or injury to Japanese religious ceremonies, or to the objects of their worship. The Americans and Japanese shall not do anything that may be calculated to excite religious animosity. The Government of Japan has already abolished the practice of trampling on religious emblems. This was the opening that the Christian community was waiting for. Naval chaplains on the U. S. ships sent letters to the headquarters of the Presbyterian, Dutch Reformed and Anglican churches, urging them to send missionaries to Japan. The Rev. S. W. Williams, who accompanied Commodore Perry and was posted at the U. S. legation in China at the time, wrote to urge that the first missionary be a medical doctor. To this call, the Hepburns eagerly responded. After leaving New York, it took a total of 170 days for the Hepburns to reach Kanagawa (the present-day Yokohama) on October 18, 1859. The long ship journey that included crossing of the Atlantic to the Cape of Good Hope, and crossing of the Indian Ocean, afforded Hepburn time to study Japanese grammar and the Gospel of John rendered in Chinese. In Kanagawa, the Hepburns rented as their mission house a Buddhist temple that was located next to the U. S. Consulate. He was soon joined by other missionaries, including S. R. Brown, a personal friend whom he first met in 1842 in Singapore, and James Ballagh, both from the Dutch Reformed Church. Unlike today’s Japan where law and order prevail, the Japan of 1859 was a dangerous place for foreigners. After two centuries of splendid and peaceful isolation, the opening of the country created havoc of unprecedented proportion. The Tokugawa bakufu had been in power since 1600. Those who aspired for its demise conspired to bring about imperial restoration. As a means of reaching this goal, they advocated jōi, or expulsion of barbarians, appealing to the xenophobic popular opposition to the opening of the country. Assassinating a foreigner became the passion for some. It insured popular support for their cause and created embarrassing and costly diplomatic situation for the bakufu. Not long after their arrival, Dr. Hepburn also faced such an assassin, but was spared, Mrs. Hepburn was less fortunate. She was attacked from behind by an unknown assailant with a crowbar. They kept these secret, for fear that these happenings could be made into major international incidents that might adversely affect their mission. At the time of his arrival in Japan, Hepburn was 44, a mature person with rich professional experiences. As younger men and women came, this once scantly populated fishing village began to take shape as a foreign settlement, and this kindly physician became its central figure. Hepburn’s first priority was to establish a clinic, which he started in a location separate from the mission house in 1861. For the next 18 years (with some interruptions caused by the government intervention), he treated an upward of 10.000 patients. To a handful of students who wanted medical training, he set aside a couple of days each week to teach them. During the last five years when the clinic was in operation, he gave Bible lessons to the waiting patients before giving them treatment. The clinic did not rely on money sent by the Mission Board. A small amount of donations came from foreigners living in Yokohama and there were occasional donations of medicine from foreign traders. The remaining cost of the clinic was borne entirely by Hepburn. For this he used up all of his savings accumulated from his 13 years of successful practice in New York. He did not charge his patients. Japanese-English Dictionary: Another goal he set for himself was translation of the Bible. However, before he could undertake this task, he had to know the language, and the study of Japanese begun in earnest. Townsend Harris helped him find a Japanese instructor by the name of Yano Ryūzan. That was in 1860. Within a year, he felt he knew the essence of the language and started to read Japanese books in order to know the Japanese thought process and to create a word list. He wanted to compile a Japanese-English and English-Japanese dictionary as the first step toward the translation of the scriptures. In 1866, the dictionary was completed. As he remarked in his preface, the Japanese language was a totally new language to the Westerners, and there were no dictionaries or grammar books available. He had to undertake everything anew. To know the Japanese people and their culture, it was imperative that one knew their language first. Furthermore, without knowing the language, he would not be able to translate the Holy Scriptures. In Japan, there were no printers capable of typesetting the English language, and he had to go to Shanghai to have the work done. He asked the Mission Board for subsidy, but the request was denied on the ground that it was not directly connected with the work of the mission. The first edition of the dictionary contained a 20,000 word vocabulary and was published in Yokohama in 1867. The second edition was published in 1872, four years after the Meiji Restoration. It added 3,000 more words to the Japanese English, and 4,000 words to the English-Japanese sections. When it came time for third edition to be published in 1886, 10,000 more words were added. The copyright was transferred to Maruzen, one of Japan’s best-known publishers. A sum of $2,000 was paid to Hepburn, which he donated to Meiji Gakuin, a school he helped found. Meiji Gakuin built a dormitory, named Hepburn Hall, with the money received. The Japanese language is written with the combination of kanji 漢字 (Chinese characters) and kanaかな (Japanese syllabary). The dictionary had to transcribe these words into Romanized letters. This system of Romanization became the basis of the so-called Hepburn system of Romanization. With some modification, and under some other names, this system is still in use today. The New Testament: On the matter of translating the Bible, Hepburn advised the American Bible Society not to recognize any translation rendered by individuals. He firmly believed that the translation had to be a joint work, and the Society should accept only those versions recommended by a committee of missionaries representing all denominations in Japan. With S. R. Brown he completed a translation of Mark and John in 1872, and Matthew the following year. A number of Japanese scholars and friends assisted them in editing and plate making. In 1874, foreign missionaries to Japan assembled in Yokohama to form a Joint Committee on Translating the Bible, which elected S. R. Brown its chairman. In 1880, the completed translation of the New Testament was published. Hepburn’s own contributions included the four Gospels, Romans, I and II Corinthians, Ephesians, I and II Thessalonians, I and II Timothy, Hebrews, James, I and II Peter, and Jude. This version became the official version of Christian churches in Japan until 1917 when it was retranslated. The Old Testament: Another committee with different members was formulated to translate the Old Testament with Hepburn as its chairman. Hepburn was the only person to serve on both committees. In 1887, the task was completed and the following year it was published. Hepburn knew Greek well enough, but not Hebrew. He utilized a year of rest in Zurich (1881-82) to restudy the language. When there was doubt, he consulted the Septuagint, Vulgate, French Bible and commentaries. Of course, there was a great deal of input by Japanese committee members, such as Uemura Masahisa, making the prose into elegant Japanese. “And it shall come to pass, that everything that liveth, which moveth, whithersoever the rivers shall come, shall live.” Citing the prophet Ezekiel, he expressed hope that the Bible would help nurture the Japanese nation. Even if his other work amounted to nothing, he felt at the time of its publication, that this remarkable book should be of far greater value than gold or silver. This version remained the official version adopted by Japanese churches until 1955. In 1886, two schools which were successors to the Hepburn Academy merged with the Tokyo Union Seminary to form Meiji Gakuin, and in 1889, Hepburn became its first president. In 1891, the first group of 20 graduated. Among them was one Shimazaki Tōson who recalled nostalgically the Christian atmosphere surrounding the ceremony. In 2013 Meiji Gaskin University will celebrate its 150th anniversary. It is both an acknowledgment of its humble beginning as the Hepburn Academy in 1863 and an affirmation of its founder’s credo: “And as ye would that men should do to you, do you also to them likewise.” A shorter form of the golden rule “Do For Others” is prominently featured in the anniversary logo. The completion and dedication of the Shiloh church in Yokohama in 1892 became the final achievement for Hepburn. Back in 1859 when he first arrived in Japan, practice of Christianity was allowed, but only for foreigners. The ban on Christianity for Japanese citizens was not lifted until 1873, six years after the new Meiji government took power. The following year, a place of worship for the Japanese was established within Hepburn’s compound. However, Hepburn strongly felt that church for the Japanese people had to be within their reach and had to be built within the place they lived. A small wooden chapel was constructed in Sumiyoshi-chō in 1876. The congregation numbered forty, and Henry Loomis became its first pastor. By 1888, church members exceeded 200 and continued to grow steadily. The city of Yokohama, which at the time of Hepburn’s arrival was a mere fishing village, became a bustling port city with a population of 90,000. At this juncture, Hepburn asked the permission of the Mission Board to raise over 8,000 dollars in the U. S. to build a church which would shine in the metropolis, attracting its citizen’s attention. He and his wife returned home to raise the money. To this was added an equivalent of $1,000 raised locally to start the construction which was completed in 1892. The same year, the couple completed their 33 years of missionary work in Japan and returned to the United States. They retired to East Orange, N. J. where three of their children were buried. James Curtis Hepburn died on September 21, 1911 at the age of 96. His wife, Clara M. Leets (nee), preceded him in death on March 4, 1906 at the age of 88. Hepburn and Ballagh, along with Leroy Janes, William S. Clark, and Jerome Davis are the names most often cited as the most influential early American missionaries to Japan. Of the five, Hepburn was the oldest and the most successful. In fact his name towers above them all in the impact left in the variegated fields of Japanese society. Why did this honor belong to an unassuming son of Milton? We know of his dedication and prayers, always seeking guidance from the Lord. This was, however, known to exist among other missionaries. What made Hepburn more successful than others came from several factors. 1. His love and respect for the people he served. While some other missionaries might have considered Japanese Christians their “spiritual children” long after they matured in their faith, Hepburn always treated them as “fellow workers in the Lord’s vineyard.” A story has it that in 1872 before returning to America on furlough he sold his medical instruments, saying that the Japanese were already producing good physicians and had no further need of him. In a similar vein, he sought a Japanese minister to be installed in the Sumiyoshi-chō Church after the death of its second pastor J. W. Knox. Instead of placing the church under an American presbytery, he established a Japanese presbytery to aid in the establishing of other churches. He planted the seeds of the Gospel and shared the harvest with his fellow Christians in Japan, who were then also charged to sow new seeds. In leaving Japan, he was able to tell the Japanese that he was going home because Japan had by then produced many evangelists of high caliber, and his own skills were no longer needed. Today we know the Japanese as a people who are self-assured. But in Hepburn’s days, they felt that the Westerners were vastly superior, and one of their goals was to become like Westerners and be treated as equals. The chance of equality in diplomacy and economy was hard to come by. But in Christianity, they saw the example set by Hepburn. His egalitarian principle was one of the keys in attracting the best minds to Christianity, and Japanese Christians, while small in number, were able to exercise a disproportionate influence in their society. 2. Steadfastness in his Bible-centered belief: Years after Hepburn left Japan, the Rev. Murata Shirō, Shiloh Church’s pastor from 1951-66 defined the church as a Bible-centered congregation in these terms: a. This church believes in the authority of the scriptures. It means that we completely subordinate ourselves under the Lordship of Jesus Christ who lives forever as witnessed in the scriptures. Only through Christ can our church find the meaning for its existence. b. The relationship between the scriptures and the church is that, within the fellowship of the church and the sermons and sacraments, the congregation will be able to read the Bible accurately and understand it. c. The Bible is both the basis for creating and nurturing our faith and providing the rules for faith and daily living. We are nurtured day by day as Christians through the forever renewing Word. The teachings that Hepburn left behind had an enduring quality to it. The building that Hepburn bequeathed was devastated by the Great Tokyo Earthquake of 1923. The building that replaced it was destroyed by the U. S. bombings during the Second World War. Rebuilt twice, the church still stands in the center of Yokohama, today the second largest city in Japan after Tokyo, and its members diligently study St. Augustine and John Calvin, following faithfully the precepts set by the Westminster Confession. Shiloh church holds a unique place in Japan where Presbyterian or any other denomination has a difficult time of maintaining its own identity. This is so because, in the development of Protestant churches in the early days, it was more convenient for denominations to pool their resources together, and consequently differences in the doctrines had been deemphasized. Among the Japanese believers, especially among the intellectuals, there was the so-called non-church movement, which denied sectarianism, and then before and during the WWII years, the Japanese government forced all churches to merge into one umbrella organization called the Japan Christian Church without regard to denomination. “The scepter shall not depart from Judah, nor a lawgiver from between his feet, until Shiloh come; and unto him shall the gathering of the people be” was the passage that gave the church its name. In Japanese Shiloh is rendered into two Chinese characters 指路, meaning to point the way. Those who hunger and those who seek are to be given guidance, for Christ shall indeed point the way. 3. His long-term commitment and ability to set long-term goals: The translation of the Holy Bible into Japanese was the crowning achievement of his ministry. Taking 18 years, he studied the languages, and constantly toiled in the vineyard. Denying credit to himself, and working twice as hard as anyone else, he accomplished a feat seldom matched anywhere. He was a remarkable team-worker, the quality that endeared him to his Japanese and American colleagues and ensured his success. His translation had a lasting impact, not just because it had the imprimatur of the American and British Bible Societies, it was done in elegant Japanese. The Psalms were rendered in such a way that it gave inspiration to Japanese poets who were in search of a new genre. Secular schools found no contradiction in incorporating Biblical passages in their school songs. His compiling of the Japanese-English and English-Japanese dictionary was just a means toward the end of translating the Bible. But it is this work that is best remembered by the secular society along with the Hepburn system of Romanization. On these alone he established a firm place in Japanese history. In seeking the kingdom and its righteousness first, everything was indeed granted to him. Hepburn’s was an age of transformation which was seldom seen in world history. In the United States, there was the Civil War. In Japan in the year 1868, the Meiji Restoration took place. The old system of government under the Shogun which had lasted continuously since 1603 was swept aside in favor of a new imperial government. A country which was isolated from the outside world for over two centuries, shifted course suddenly in favor of rapid Westernization and industrialization. Old values and moral codes were cast aside without anything to replace them. It was at this juncture that the newly translated Bible appeared. Hepburn’s firm belief in the need to translate the Bible, his long-term project, was predestined for success and required no mid-course correction. The Bible as translated filled the cultural and moral void that existed in the age of uncertainty. The undertaking also signified Hepburn’s belief in the Japanese people’s ability to know God through the Holy Scriptures. Luther’s notion of universal priesthood of all believers was, in effect, transplanted to Japan in this manner. Incidentally, today, the Bible remains the all-time best seller in Japan. 4. His relative independence from the Mission Board: This is not to say that the Board’s existence was injurious to his work. On the contrary, without the Board’s support, Hepburn would not have been in Japan. However, on some critical issues, the Board was blind to the needs of this kindly missionary doctor. Its refusal to help the printing of the Japanese-English and English-Japanese dictionary, for example, was a case in point. He had to finance this and some other most important projects out of his own pocket, or from contributions from sources other than the Board. He selflessly used up 13 years of accumulation from his New York practice to treat his patients free of charge while in Japan. His relative independence from the Board gave him the freedom to concentrate on more essential work which he had assigned to himself. Hayashi Tadasu, who as Japan’s Minister to London, concluded the Anglo-Japanese Alliance in 1902. Then there was one Ōmura Masujirō, a samurai, who would ride 30 miles each way on horseback from Edo to Kanagawa to study in her classroom. Their educational impact was not confined to politicians and diplomats. Shimazaki Tōson, cited earlier, was one of the three most important writers of the early 20th century. His sojourn from naturalism to romanticism, his exposing of social ills through his pen, and his reaffirmation of Japan’s tradition have enriched Japanese literature and endeared him to millions of readers. As a student he lived in the Hepburn Hall. After graduating from Meiji Gakuin, he taught for a time at Tohoku Gakuin, another mission school started by the Rev. William E. Hoy of Mifflinburg, Pennsylvania. Thus unknown to the millions of Japanese who have read Tōson, Central Pennsylvania has a solid presence in the formulation of modern intellectual current in Japan. At the time of revising this article in May 2011, the devastations wrought by the triple disasters of earthquake, tsunami, and nuclear meltdown are still fresh in minds. In these difficult times, the Japanese people have demonstrated their resilience, good manners, and spirit of hope. It was the same spirit that brought them back from the devastations of the IIWW, and when combined with their work ethic, brought unprecedented prosperity to Japan in the 70’s and 80’s. Even though it had yielded the position of the second largest economy to China during the past year, it remains a strong economic power. Scholars are quick to point out the power of the traditional teachings based on Confucianism as the guiding principles that led to Japan’s success. But who is to say that is all? To a remarkable degree their work ethic finds its counterpart in the Protestant ethic that had made this country great. It may even be that when Japan was unsure of herself, it was Calvinists like the Hepburns that provided the moral withal for them to stand on. History has a curious way of finding similarities in unsuspected corners of the world at different times. Today our scripture-based traditional values are under attack, and we are taught to become politically correct. The moral confusion we experience is eerie similar to the Japan of 1880’s when they were asked to deny their Confucian heritage. If at that time they were able to obtain the best from the children of Central Pennsylvania to regain their footing, we must open our eyes and ears to discern if the seeds once sown by the Hepburns and others in Japan can now be replanted in Central Pennsylvania. [I] I am indebted to the late Rev. John H. P. Strome for getting me interested in writing this article and then presenting it to the Presbytery of Northumberland in the spring of 1988. This revision is made in May 2011. In this article Japanese names are given in the Japanese order where the family name comes first. [II] Professor emeritus of History and Japanese Studies, Bucknell University . 高橋是清(1854-1936) Born in Edo (Tokyo), studied in the United States, taught English after his return, became a financier, President, Bank of Japan, Finance Minister, Prime Minister, head of the Seiyūkai Party, assassinated in the February 26 incident. On Hepburn, I have relied heavily on Professor Takaya Micho’s seminal work Hepburn (ヘボン) which was published by Yoshikawa Kōbunkan in 1961 as part of a series of biographies of 100 most prominent persons who ushered in modernization to Japan. Prof. Takaya also translated The Letters of Dr. J. C. Hepburn (ヘボンの手紙) into Japanese (Tokyo: Yūrindō. 1976). Another useful volume is The Centennial History of Shiloh Church (指路教会百年の歩み) written, edited and published by the church in 1974. See David Lu, Japan: A Documentary History (Armonk, N.Y.: M. E. Sharpe) p. 291. Samuel Rollins Brown, D.D. (1810-1880). In Japan from 1859 to 1879. Served as chairman of the committee in charge of translating the New Testament into Japanese. His mother wrote the hymn I love to steel awhile away, and he himself was known for his poetical skills. Headquarters of the Shogun, endowed with full military and administrative power, or Shogunate. Contemporary Japan has gone one step further. In 1987, the Japan Bible Society published the New Inter-confessional Translation by an executive committee of Catholics as well as members of Protestant denominations. 植村正久(1857-1925) evangelist, pastor of Fujimichō church, one of the founders of Tokyo Shingakusha (Seminary), a prolific writer in defense of evangelical faith. A seminary established in 1877 through a merger of schools maintained by the Presbyterian Church in the United States, the Dutch Reformed Church in America, and the United Presbyterian Church of Scotland. Luke 6:31 see also Matt: 7:12, King James Version. Leroy Lansing Janes (1838-1909), a Civil War veteran, taught in Kumamoto and Kyoto between 1871 and 78. Also served as a missionary for the Reformed Church in America. William Smith Clark (1826-1885) While president of the Massachusetts Agricultural College, he was invited by the Japanese government to help establish the Hokkaido Agricultural College in 1876. His parting words to his Japanese students “Boys be ambitious” are well known. Jerome Dean Davis (1838-1910), became a missionary to Japan in 1871 and served for 39 years. An early collaborator with Niijima Jo (新島襄) in the founding of Doshisha Academy. The Centennial History of Shiloh Church, op. cit. p.228. The tradition of preaching the whole counsel of God and of diligent study of the Scriptures was quite evident during my visit to Shiloh Church in 1992. Genesis 49:10, King James Version. Hepburn portrait courtesy of Meiji Gakuin University. 林 董 (1850 – 1913) Born in the present day Chiba. His education at the Hepburn school led him to be selected as one of the 14 students sent by the bakufu to England. Accompanied the Iwakura Mission to Europe and the U. S. 1871-1873. Aside from London, served in various diplomatic posts as well as one term as foreign minister. 大村 益次郎 (1824 – 1869). Born in Yamaguchi. Early on interested in knowledge from the West that led him to Nagasaki. In the Chōshū han (domain) introduced the concept of military training for both samurai and commoners. Under the new Meiji government he advocated adoption of the same concept which led to his assassination by a disgruntled samurai. Considered the “Father of the Modern Japanese Army”. William Edwin Hoy (1858-1927) as a missionary to Japan from the Reformed Church of America, he quickly identified Sendai as strategic. Upon arrival in January 1886, he launched a school for training Japanese pastors. See for example Fukuzawa Yukichi’s (1834-1901) 1885 essay “Good-bye Asia 脱亜論” that advocated discarding of Confucianism in favor of Western civilization. Lu, op. cit. pp. 351-53.